If you are looking for a wedding invitation that is less focused on the traditional elements of your wedding but instead aims to capture a spirit and sense of adventure, this is definitely the sort of wedding invitation you should be looking out for. The wooden yellow floral wedding invitation from Norma & Dorothy is far from your traditional wedding invitation but if you plan on having a wedding ceremony or celebration that is far removed from your traditional wedding party; this is the invitation that lets your audience know exactly what they should be looking forward to. The floral pattern, available in yellow, green and dove grey, sets a refreshing and light tone, making this a suitable invitation for a spring or summer wedding. 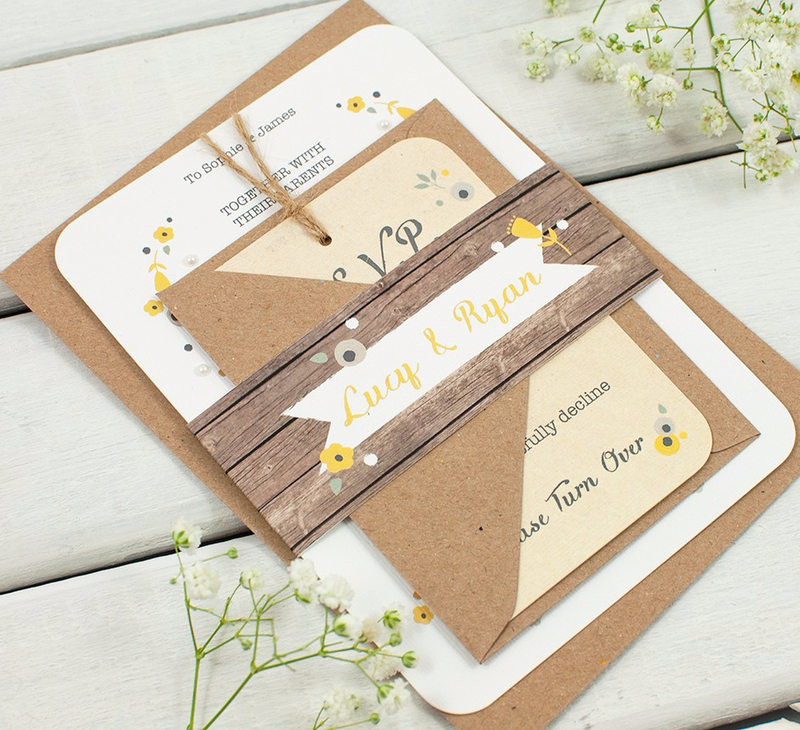 The rustic feel is repeated throughout the invitation, and additional stationery products, and there is a sense of hand-made and craft running through the invitation. The band that holds everything together has been crafted to look like wood and there is even rustic twine for the RSVP tag. When it comes to taking a step back in time away from the more commercialised notion of a wedding ceremony, this is a perfect way to inform your guests of the happy occasion. The fact that gems have been applied by hand ensures that there is a unique approach to this invitation, which only enhances the kooky and quirky nature of the invitation. This isn’t going to be a wedding invitation that is suitable for every couple but for a wedding that aims to draw on some rustic charm, it is the ideal wedding invitation. With a fresh and playful font, this is a wedding invitation that will put a smile on people’s faces whenever they see or think of it.